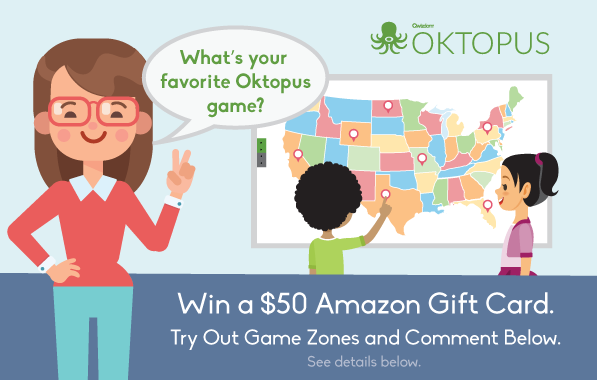 The 2019 Game Zones Comment (“Contest”) is open only to legal residents of the fifty (50) United States and the District of Columbia who are seventeen (17) years of age or older and are actively employed as a K-12 classroom educator. Employees, officers and directors of Qwizdom Incorporated, Boxlight, and Mimio, as well as the immediate family (defined as parents, spouse, children, siblings and grandparents) and household members of each such employee, officer and director are not eligible to enter. Any person who has been awarded a prize or reward from participation in a Qwizdom sponsored promotion in the past 18 months are not eligible to enter. All federal, state and local laws and regulations apply. By participating in the Contest, entrant fully and unconditionally agrees to and accepts these Official Rules and the decisions of Qwizdom Inc., which are final and binding. Void outside of the U.S. and where prohibited by law. The Contest period begins on February 5 at 12:00 AM CST and will end on February 7, 2019 at 5:00 PM CST. The selections for the contest award will take place on or about February 7th, 2019. During the Contest Period, go to https://www.facebook.com/qwizdom/, https://twitter.com/Qwizdom, or https://www.instagram.com/qwizdom.us/ and comment on the Game Zones post to enter the contest. No purchase necessary. You must comment on a specific Game Zones game explaining how/why the game has helped with your instructional practice, provide suitable contact information and agree to Contest terms & conditions. By commenting, you agree to allow Qwizdom Inc. (a Boxlight company) rights of use, reuse and reproduction for marketing and corporate communications purposes. This includes any images, video, testimonials or other content included in or referenced in any Contest entry. Limit: up to two (2) comments per person, per social media page allowed for consideration. If more than two (2) comments are received for a single individual, the individual may be disqualified from the contest. Preference is given to comments which contain multimedia (images or video). Any use of automatic, programmed or similar entry methods or agents (including but not limited to sweepstakes entry services) will void all comments/entries by that entrant. Comments will be acknowledged with a “like”, or similar, within 48 hours of post. Qwizdom Inc. is not responsible for late, incomplete, invalid, unintelligible, technically corrupted or misdirected comments, all of which will be disqualified. In the event of a dispute as to the identity of an entrant (“commenter”), the authorized social media account holder used to comment will be deemed the entrant. The “authorized account holder” is the natural person assigned to the social media profile by the website responsible for assigning profiles for the respective domain. 1. Originality (25%): Does the comment introduce a creative, original, innovative perspective? 2. Relevance to Teaching (25%): Does the comment relate to teaching and learning? 3. Effective Use of Multimedia (50%): Does the comment leverage and use video, images, screen casts, animations or other forms of multimedia? Qwizdom Inc. (a Boxlight company) will announce the Winners on or about February 7, 2019 on each Qwizdom social media page (Facebook, Twitter, Instagram) and attempt to notify individual commentators via e-mail and/or direct messaging (at Qwizdom Inc. discretion and using the information provided). If a Winner cannot be contacted within seven (7) days after the first attempt to contact him/her, another Winner will be selected in his/her place at random from among all eligible Finalists. Potential winner must comply with all terms and conditions of these Terms and Conditions and winning is contingent upon fulfilling all requirements.